KEAM 2014 allotment schedule and important dates of first, second and third phases are given here. Students who are seeking admission for Engineering/Medical/Architecture courses should know the important dates connected with the allotment to complete the online and offline process on time. The Commissioner of Entrance Examinations has published the notification regarding the 2014 admission process. The publication of rank list for professional courses by the Commissioner of Entrance Examinations marked the next phase of admission procedure in Kerala. As the admission process to the Engineering/Medical/Architecture courses for the academic year 2014-15 is nearing the allotment stage, it is very important to know its complete schedule. The allotment calendar would enable them to complete the online and offline process before the stipulated time. According to the admission procedure, after the initial option registration process get completed, a trial allotment list would be published which marks the beginning of the allotment process. As it is preliminary allotment made only for general reference, students need not to pay the fee or take admittance in the colleges based on it. Added to the trial allotment, the Commissioner for Entrance Examination (CEE) will also publicize the general last rank for each category, course and college. Those students who couldn't register some options can make required changes in their option registration. The KEAM allotment schedule 2014 will guide the students & parents to know the important dates concerning the Admission method. The Commissioner of Entrance Examinations has initiated 'Option Facilitation Centres' (OFC) and 'Help Desks' (HD) with internet facility to facilitate students to complete the registration process. 19 Help Desks (HD) and 32 facilitation centres with facility for Password reset and obtaining key numbers for option submission functioning are functioning in different parts of the state.According to a press release from CCE on 21st June, 12,49,640 have been received till date. Based on the trial allotment, students will be able to modify and rearrange their options before 5 PM on 23rd June 2014. After the time allocated for making changes in the options, the first allotment would be announced. (The allotment dates might be changed or postponed due to official reasons). The schedule for further allotments will be declared in due course. Students can download the notification regarding the CAP 2014 from the CEE website which would give a clear idea about the various institutions and also the fee structure of various courses. 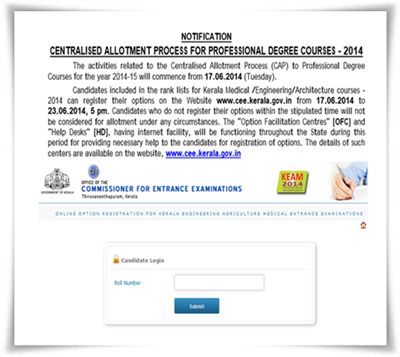 KEAM 2014 online option registration procedure has started at the CEE website www.cee.kerala.gov.in. KEAM 214 online option registration for Engineering, Architecture, MBBS, BDS, Ayurveda, Homoeo, Siddha, Agriculture, Forestry, Veterinary and Fisheries should be completed before 23rd June 2014. KEAM 2014 trial Allotment results for Engineering/Medical/Architecture courses will be published on 20th June. The Commissioner of Entrance Examinations will publish the trial allotment for admission to the Engineering/Medical/Architecture courses, Kerala for the academic year 2014-15. Candidates, who got their names included in Kerala Medical (Except MBBS/BDS)/Engineering/Architecture Entrance Examination rank lists, can check the trial allotment on 20th June at the CEE website. KEAM 2014 trial allotment published results for Engineering/Medical/Architecture courses has been published on 21st June at CEE website. The Commissioner of Entrance Examinations has published the trial allotment for admission to the Engineering/Medical/Architecture courses, Kerala for the academic year 2014-15.